Sixty years ago this month, the legendary billionaire and aviator became GE Aviation’s first jet airliner customer. It was a bumpy ride. The mid-1950s ushered in the exciting age of the modern jetliner as airlines captured the public’s imagination with sleek and fast jet-powered aircraft that left their piston-powered predecessors in the runway dust. It began in England when the de Havilland DH 106 “Comet” entered service in 1952 as the world’s first production commercial jetliner. (GE legend Brian Rowe worked on its engines as a young apprentice.) But three Comets tragically broke up in flight from metal fatigue, grounding the plane for an extended period. This opened the door for the Boeing 707 and the Douglas DC-8 jetliners. Both launched in 1955 to great fanfare, and they never looked back. With its innovative military jet engines, GE would have been a prime candidate to power these jetliners, but had no suitable engine design to offer. Pratt & Whitney, a leader in piston engines, jumped ahead with its JT3 jet engines for the Boeing and Douglas aircraft. But GE’s aviation leaders in Evendale, Ohio, had a plan up their sleeves. Convair, a commercial aircraft company acquired two years earlier by General Dynamics, entered the jetliner sweepstakes by touting the world’s fastest medium-range jetliner with the Convair 880. In 1955, Convair engineers huddled with Howard Hughes, who controlled Trans World Airlines (TWA), and created the aircraft’s specifications. Given its military heritage, General Dynamics valued aircraft speed. Also, it had a strong relationship with GE, which powered the airframer’s B-58 supersonic bomber with the J79 engine. Powering also the F-104 and F-4 fighters, GE’s J79 was the decade’s dominant fighter engine. GE removed the J79’s military afterburner, and the CJ805 commercial variant was born to power the Convair 880. Sixty years ago this month, Hughes launched the program by ordering 30 aircraft, while Delta Airlines soon ordered 10. It was official – GE had entered the brave new world of commercial jetliners. The airline industry was abuzz. The Convair 880 was light and fast, with thrust reversers for its four powerful CJ805 engines. Add the star factor of Howard Hughes: Dashing business tycoon, film maker, and aviator who created Hughes Aircraft in1932. He piloted numerous world air-speed and distance records, introduced numerous aircraft innovations, and took control of TWA, transforming it into a world leader. His history of surviving plane crashes, and piloting the H-4 Hercules (known as the “Spruce Goose”) on its lone flight only fueled public fascination with the tall, handsome Texan. But Hughes, by then increasingly a recluse, helped to doom the Convair jetliner before it left the hangar. To avoid outside financing, Hughes bought the airplanes through his Hughes Tool Company (his father created the family fortune in Texas producing oil-drilling equipment) – a huge personal investment even for Hughes. He arranged to lease the planes to TWA. Then, stories abounded about Hughes’ field inspectors delaying progress of the Convair 880 at the General Dynamics hangars in San Diego, California. By the time it began flight testing in 1959, TWA board members had sued Hughes, claiming he delayed aircraft deliveries to avoid paying for them. Convair also blamed Hughes for severely impeding sales to other customers. Hughes insisted Convair agreed to make TWA and Delta the exclusive customers for a certain period. Either way, when the Convair 800 finally entered service in 1960, sales stalled with a handful of customers. By then, Hughes had to relinquish ownership of TWA, which he had controlled for more than 25 years. The Convair delay allowed the 707 and DC-8 to demonstrate their effectiveness with several key airlines, and Boeing also launched a variant of the 707, called the 720, with United Airlines. But it was curtains for Convair. Its jetliners, among the fastest jetliners in the skies, carried too few passengers to compete with the larger DC-8, and Boeing 707 and 720 aircraft. Convair 880 production ended in 1962 with 65 sold, and the 990 ended its production run a year later with 37 sold. At the time, it was dubbed the largest debacle in commercial aviation. Convair never created another jetliner. Hughes’ erratic behavior aside, there was plenty of blame to go around for Convair’s failure, including significant aircraft and engine performance issues. GE’s CJ805 engine faced durability problems, including fan-blade cracking. But GE stood behind the Convair jetliners, even though the program was doomed, with a committed engine product support organization. 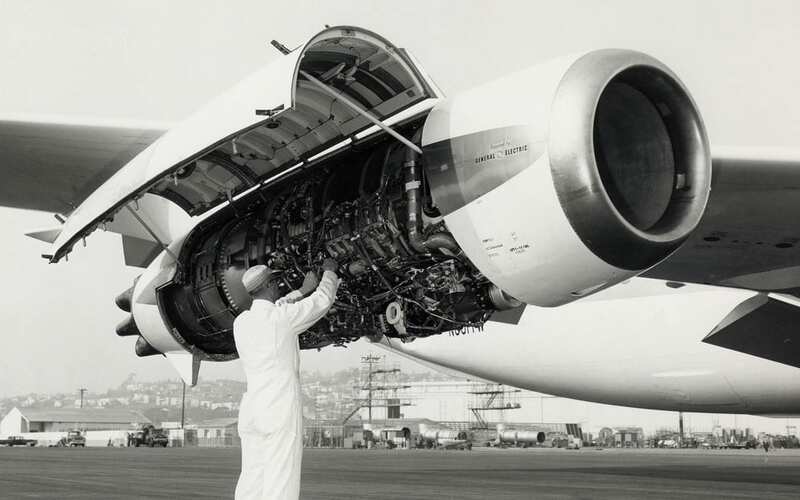 The hard-earned lessons paid off when GE Aviation re-entered the commercial jetliner industry in 1971 with its CF6 engine (based on the TF39) for Douglas DC-10 and Airbus A300 jetliners. The A300 engine selection of the GE engine fostered a relationship with Snecma, the French jet engine manufacturer and key partner on the CF6 program. In 1974, GE and Snecma formed CFM International, the 50/50 joint company which ultimately produced the best-selling jet engines over the past three decades. In 1976, Hughes died at age 70 while flying as an ailing passenger aboard an aircraft. A year later, TWA retired its last Convair 880s. Today, fewer than 20 of the Convair 880s and 990s remain. There is, however, a group trying to restore the planes. Finding surviving CJ805 engines is also challenge. However, in the Brian H. Rowe Learning Centre of GE Aviation’s world headquarters in the northern suburb of Cincinnati, Ohio, a restored CJ805-23, hangs from the ceiling in the front lobby. The beautifully-painted black and blue CJ805-23 with an eye-catching aft fan celebrates GE Aviation’s long history of innovation – and a corporate culture today that continues to foster big technology dreams. And it recalls the exciting dawn of the early jetliners, and one Howard Hughes, whose achievements and travails, will continue to fascinate historians for generations to come.